The easiest way to have power is to have money. When you’re rich, you can tell people what to do and they do it because they want a piece of the wealth. Jake discovers this truth in “Furniture & Meat,” and it drives him to the brink of sanity. Finn and Jake have so much treasure stocked up that it’s causing structural damage to their tree house, but when they start spending their funds in Wildberry Kingdom, Jake loses all sense of morality so that he can get what he wants. “Furniture & Meat” is a throwback to early episodes of Adventure Time, teaching a specific lesson without incorporating any of the serialized plot elements currently running through the series. This episode could easily take place in seasons two or three, and while it’s not quite as substantial as recent installments, it’s still very entertaining. Having watched “Food Chain” about 10 times in the last week, it’s nice to be back in familiar Adventure Time territory. “Furniture & Meat” is surrounded by event episodes—next week will debut a new Fionna and Cake episode—so airing a low-key standalone episode in the middle is a smart way of making sure those events feel monumental. This week’s episode opens on Finn and Jake chilling in the sun while BMO and NEPTR pretend to be Robbing Hood and the Sheriff of Naughty-Hams, a fun little sequence that highlights this show’s silly word play. NEPTR wants to play Friar Tux, but BMO needs a villain to fight so he draws a mustache on his friend, facial hair that Friar Tux would never have. BMO hasn’t gotten a lot of play this season, but this episode makes great use of him by having him be an adorable swashbuckler that ultimately saves the day. NEPTR is his dim-witted companion, and it’s a partnership that I hope to see explored further this season. 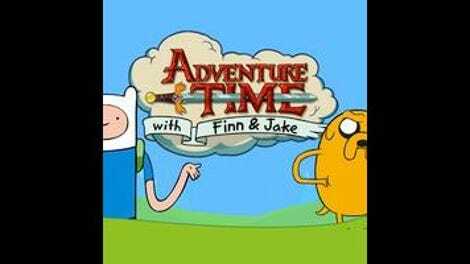 Finn and Jake head to the Wildberry Kingdom after their massive treasure stash busts through the side of their money room, and it doesn’t take Jake long to learn that he can use his gold to get people to act a certain way. He bribes the police officer that tells him he’s not allowed to keep his money in the kingdom’s central fountain, and is able to get a man to dance by offering him some moolah. It’s a huge rush at first, but Jake quickly becomes bored and decides to take his spending to the next level. Jake’s mindset is representative of entertainment producers that traffic in exploitation for profit. We live in the reality TV age where people regularly allow themselves to have their lives filmed and edited in an often-exploitative manner, which is fine if it means national exposure and/or financial compensation. When Jake breaks into the home of an elderly couple of Goji Berries, he waves bag of money in their face to get them to do things that make them uncomfortable. The wife doesn’t like sleeping on her husband’s side of the bed, and Mr. Goji Berry’s sleep apnea prevents him from sleeping on his back. Jake gives them one last chance to make some money, and all they have to do is eat it first. Finn apologizes while Jake goes to the tool shed to look for dessert, and when Finn confronts his best friend about his crazy behavior, he learns about the capitalist mentality that has taken advantage of people for centuries. Jake has money, the Goji Berries want the money, and Jake wants to see them do things. It’s fully in Jake’s rights to use that money to coerce the couple, because that’s how a capitalist economy works. People provide a service in exchange for payment, and if they don’t want to provide that service, you offer them more money until they do. It’s called the free market. Mad with power, Jake decides to spend all of his money in one last big buy, breaking into Wildberry Princess’ decompression chamber so that he can sit on her head. He’s wildly insubordinate, and despite the Princess’ protestations, he shrinks down to sit on the tiny stool atop her berry head. For this offense, she confiscates all of Finn and Jake’s money and sentences them to execution by encasing them in their own molten gold, but luckily BMO is there to save the day with his Robbing Hood bow and arrow. His aim is horrible, but it gets the job done. As Finn and Jake flee the kingdom, Wildberry Princess tells them she’ll double-dip them in gold if they return, unless they send a written apology. On the way back home, Finn finds a gold coin that he can flip to decide who writes the apology, but Jake wants nothing to do with the money. 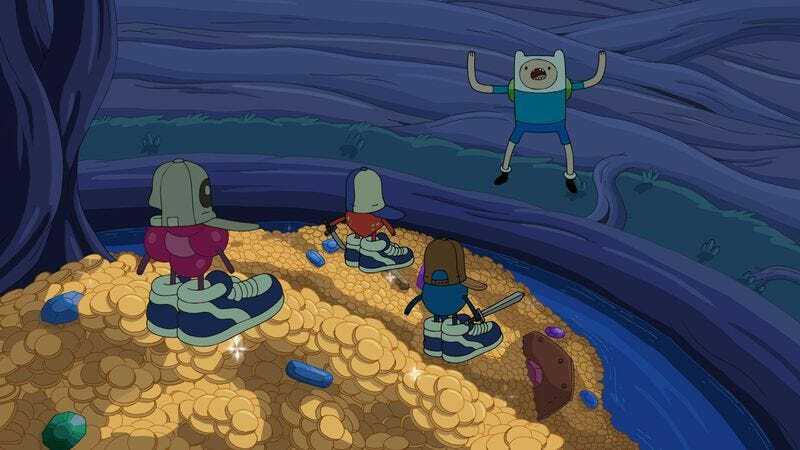 When Finn throws the coin into their now-empty money room, it rolls and falls down a hole in the floor, a visual representation of their triumph over greed. Money just causes them problem, so maybe it’s best if they keep their treasure room empty. I love the music in this episode, especially the grimy “M-m-m-money” hip-hop beat that recurs throughout. I’m very happy to see NEPTR more often. I like him and BMO together.